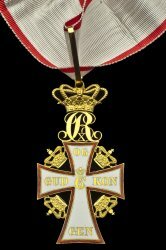 Ribbon: White with red edges. 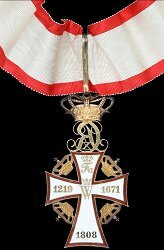 Instituted: 12 October 1671 by King Christian V.
Awarded: For special deeds or conspicuous service to Denmark. 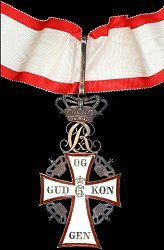 Grades: 6 plus a Silver Cross - renamed Cross of Honour of the Order of the Dannebrog (Dannebrogordenens Hæderstegn) in 1952. 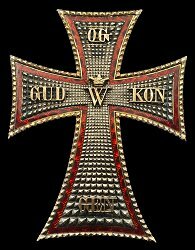 * Male holders of the Commander 1st Degree wear a neck badge and star, female Commanders 1st Degree only wear the star.